Reptiles evolved from limbed ancestors, and they have an axial skeleton consisting of the vertebral column, limbs, and central nervous system encased in bone. 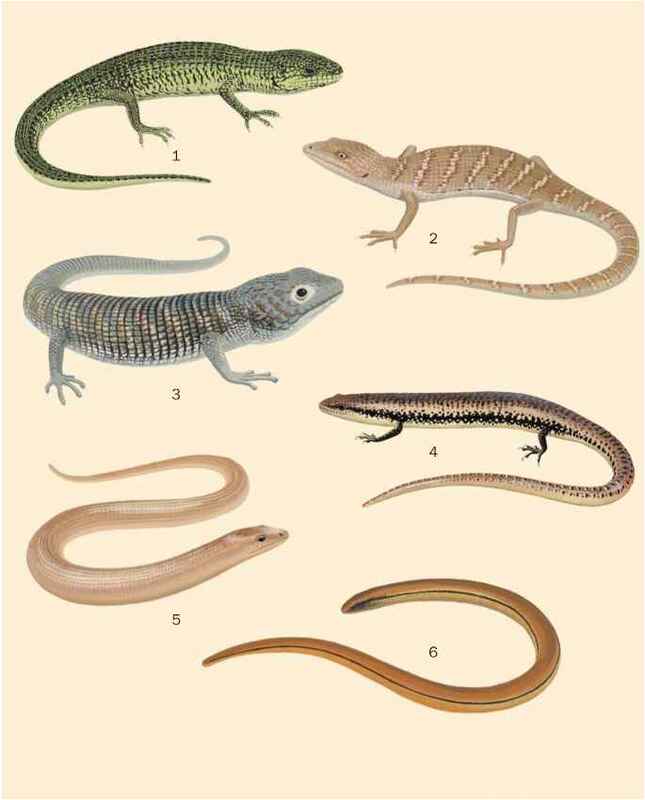 The loss of limbs in snakes and some lizards evolved secondarily from limbed ancestors. Many of the fundamental features of the reptilian skeletal system and its attached musculature reflect adaptations for support and locomotion in terrestrial environments where strong weight-bearing elements are essential for counteracting gravity. The aquatic to terrestrial transition of early vertebrates also required reorganization of many internal organs related to weight bearing, changes in breathing and distribution of body fluids, specializations of sensory systems, and reorganization of the feeding apparatus. The skeleton of turtles is largely rigid, and aspects of its structure are unique among vertebrates. The shell that encompasses the body, consisting of a dorsal carapace and ventral plastron (joined laterally by a bridge), is composed of fused bone that includes the ribs, vertebrae, and parts of the pectoral girdle. Both the pectoral and pelvic girdles are located within the rib cage. The bony elements of the shell are covered externally by corneous plates or, in fewer species, leathery skin. The overall shape of the shell varies greatly, and the shell is rigid in most species. The enclosure of internal organs by the shell precludes breathing by expanding and contracting the rib cage. In some lineages of turtles, partial flexibility of the body has been achieved by reduction, softening, or hinged articulation of the shell elements. Some species have evolved the ability to close the body within the shell during withdrawal of the head and limbs. walking turtle tends to pitch and roll, and the forefeet catch the weight of the animal as it falls forward. It has been suggested that slower-acting muscles characteristic of turtles cannot adjust rapidly during movement to eliminate inherent instabilities related to the shifting center of gravity. Crocodilians are characterized by short, powerful limbs and a muscular tail that is used in swimming. The spine is flexible, and individual vertebrae are strengthened by the addition of bone that is curved in the forward direction. These animals are excellent swimmers, and saltwater crocodiles are known to disperse long distances over the sea. Crocodilians are capable of surprisingly fast movement on land, and one species is known to gallop. The skull has evolved a secondary palate that separates the respiratory passages from the mouth cavity and allows these reptiles, and some turtles, to breathe with only the tip of the snout exposed to air. All crocodilians are aquatic. evolutionary trend for many lineages within the squa-mates. Some members of most families exhibit variable degrees of limb reduction, usually the loss of a few phalanges but in numerous lineages the total loss of limbs. All snakes are limbless, and limb reduction has evolved repeatedly among various lineages of lizards. The evolution of limb-lessness usually is associated with burrowing habits or with life in dense grass or shrubbery. In pythons, which have vestigial hind limbs, Hox genes that specify development of the limbs are differentially expressed. The result is absence of forelimbs and shoulder girdle but de velopment of some elements of the pelvic girdle and femur. Modifications of Hox gene expression appear the likely mechanism for body elongation and a repeated pattern of vertebral development without limbs. These developmental processes produce more than 300 vertebrae in pythons with ribs on all but one of the vertebrae in front of the hind limbs. The ability to lose the tail easily when seized by a predator is called caudal autotomy and is characteristic of tuatara, many lizards, and some snakes. With few exceptions, autotomy is attributable to fracture planes within the vertebrae. These planes are enveloped by muscle and connective tissue arrangements that allow easy separation of the elements. When the tail is separated, the frayed muscle bundles collapse and seal the end of the broken tail while the lost end reflexly wiggles to attract the attention of would-be predators. Thus au-totomy and rapid tail loss are an effective adaptation to confuse or deter predators. 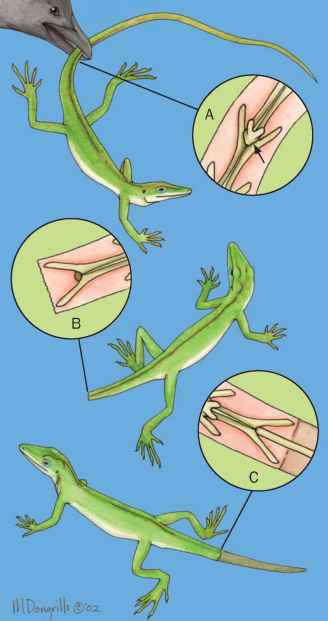 The tail regenerates to varying degrees in most lizards, but the regrown tail has an axis of cartilage rather than bone and is not as long as the original structure. 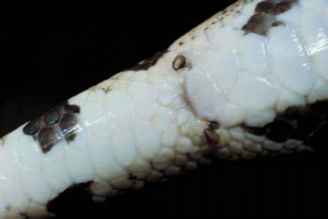 Separation of tails in a few species of snakes occurs between the vertebrae, and the broken tail does not regenerate markedly. The mechanics and energetics of locomotion have been analyzed in some detail for various reptiles, especially snakes and lizards. All reptiles living in water are secondarily aquatic and, with the exception of turtles, swim by means of axial propulsion involving undulating waves that are passed along the body and tail. Such swimming is associated with a large muscle mass, sometimes amounting to more than 50% of the body mass. There is a high conversion of muscle energy to thrust energy, which in some cases may exceed 90%. The more posterior parts of the body contribute most to thrust, and forces are maximized when the greatest depth of the body is posterior. Examples of adaptation to this principle are the paddle-like tails of sea snakes and the vertically flattened tails of crocodilians. Other characteristics that assist swimming are a flexible body to maximize amplitude of undulation, large ratio of muscle mass to body mass, and a relatively large body and caudal area. The energy cost of swimming is generally severalfold more economical than is locomotion on land. Buoyancy contributes to the efficiency of locomotion in water. Swimming turtles use paired appendages that beat backward and forward, acting like paddles. This mode of locomotion achieves lower power and is less efficient than that involving use of body undulation. The forelimbs of sea turtles can create lift forces similar to those made by an airfoil. Movement on land includes quadrupedal, bipedal, and limbless locomotion, depending on the species of reptile. The limb or the ventral aspect of the body pushes on the ground at an angle, eliciting an equal and opposite reactive force on the foot or body. The reactive force can be resolved into a forward propulsive component, which generates thrust in the direction of movement. Part of the energy required for locomotion is devoted to support of the body and the maintenance of posture by limbs. When quadrupedal reptiles move at slow to moderate speeds, the body moves in such a manner as to maintain the center of gravity over the shifting base of support during alternating movement of the limbs. Most lizards have a sprawling limb posture, but some quadrupedal reptiles, such as chameleons and rapidly moving crocodilians, have evolved a more erect or nearly vertical position of the limbs. While the animal is standing, the musculature must support the body between the laterally placed feet. However, most reptiles do not remain standing while motionless but minimize expenditure of energy for postural support by resting the body on the substrate. Sprawling limbs promote stability and are advantageous when lateral undulations of the body are used in locomotion. During walking or running, substantial lateral bending of the body axis promotes longer stride length, which is also increased by specialization of the limb girdles. Progressively more distal elements of the arm or leg describe successively larger horizontal ellipses relative to the shoulder and hip, and the feet may twist in their tracks. The hind limbs are longer and usually more robust than are the forelimbs, and they provide most of the propulsive force. Other specializations of the hind limbs include elongated toes, fringed scale appendages on toes to assist movement on sandy substrates, and close union of the first four metatarsal bones while the fifth metatarsal functions as a lever to extend the ankle. Several species of lizards are capable of running bipedally on their hind legs, a well-known example being the Neotropical Jesus Christ lizard, the common basilisk, Basilis-cus basiliscus, which can run over the surface of water. the axial muscles and are perpendicular to the contact surfaces, so friction is not used. Progression requires at least three posteriorly directed force vectors (contact points) to be stable. All three of the other modes of locomotion are different from lateral undulation in having propulsive forces that act horizontally in the direction of movement and are transmitted across zones in which the trunk makes static contact with the substrate. In concertina locomotion, progression is accomplished with stationary body parts as an anchor to push or pull the rest of the body forward. The friction associated with static contact is used as a reaction force to allow forward progression. Forward movement involves alternate anchoring, folding, anchoring, and extension of the body as the muscles act somewhat like an accordion between the zones of static contact. Because acceleration alternates with deceleration, this type of movement is comparatively slow and energetically costly. Sidewinding is a method of locomotion used for progression on relatively flat, low-friction surfaces such as desert sands or mud flats. In this movement, sections of the body are lifted, moved forward, then set down in such a manner that the body is usually in static contact with the ground at two points. Once the neck of a snake contacts the ground at the forward point, the body is essentially "rolled out" on the substrate, producing a series of separate, parallel tracks oriented at an angle to the direction of travel. A variation of sidewinding, termed saltation, occurs when the body is straightened so strongly and rapidly that it lifts completely off the substrate. This mode of locomotion and slide pushing, whereby posterior contact zones of undulating snakes slide backward relative to the ground, are associated with rapid escape movements. The fourth principal mode of limbless locomotion involves laterally symmetric use of muscles associated with the ribs and the flexible skin. Termed rectilinear locomotion, this mode involves alternate placement of ventral scales in static contact with the ground followed by active stretching to extend the ventral wall (like an inchworm) and produce straight-line progression. The anterior surface of the snake progresses at a more-or-less constant velocity and conserves momentum because the mass of the animal continues to move. Movements of limbless reptiles such as snakes can entail a mixture of the modes of locomotion, each of which may be influenced by the size of the snake, nature of the substrate, temperature, or stimulus for movement. Both lateral undulation and sidewinding are more rapid modes of progression than are concertina or rectilinear modes of movement. 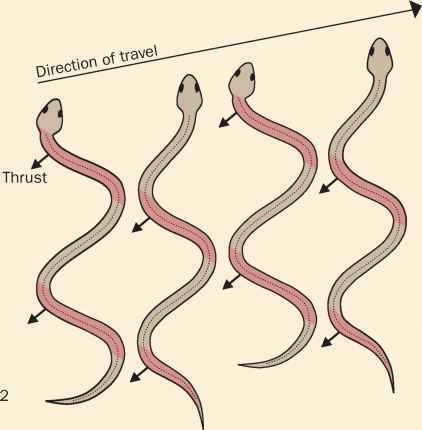 In faster-moving snakes, such as whipsnakes and racers, the locomotor muscles are elongated to span many vertebrae and create long arcs during undulating movements. Yet these muscles are lightweight owing to elongation primarily of tendons rather than of the active muscle mass. In contrast, snakes that constrict their prey, such as boas and pythons, have heavier, shorter muscle units that produce great strength of constriction but slower locomotion. How snakes move ribs muscles? How are muscles and skeletons related to the movement of an animal?